Would you stop reading a book if an element of the plot strongly clashed with your personal beliefs or would you continue reading the book? Oh good question! I think it depends on the way the author handles the issue. If the character is doing something or something is happening that I am very much against but I felt like it was handled in a way that wasn't pushing an agenda and perhaps just shedding new light on an issue I would probably keep reading. If it came across like the author was telling me how to feel or think about something than I would stop reading. I'm not a fan of books like that even if I agree with the author's POV! I'm on a roll with cozies lately and Gretchen Archer's Davis Way series has been on my TBR for quite sometime. When I was offered the chance to review the first book in the series - Double Whammy - I just couldn't resist. So far I'm loving it! Davis Way is a great character - tough and smart though with a tendency to run headlong into disaster. A little unemployment goes a long, long way, and after more than a year of it, applying for every available position in L.A. (Lower Alabama), I took a right and tried Mississippi. "I just do. Because you can't get in those safes with a tool." My jaw unhinged. How in the world did George know what I was doing? Things sound a bit like they're unraveling. There's not many good law abiding reasons for Davis to be trying to open a safe! For the question I would probably keep reading. If it was super pushy with an agenda maybe I would stop. Enjoy your cozy!! I agree with Geybie, comment above. Depends on how it's written but if it's unlikely I would pick up a book with subject matter adverse to my line of thinking. Example, if it's about gun control I don't have an intersect, or religious books. Zero interest so I would be unlikely to start it. You sure are on a cozy readathon Katherine! I agree with that answer. If an author is honestly examining an issue that's one thing, if they're pushing an agenda that can be something else. That's a fun beginning, I like how she's all like well I'll try mississippi now! Looks fun! Oh yes - keep reading! Sounds like a cozy with a chuckle on the side. What's not to like? I agree with you on the blog hopper question - although, I will sometimes actually keep reading! Just so that I can rant and rave a whole lot more afterwards. LOL!!!!! I do have a problem with books that let morality just slide. Have a look at my complete answer and hope you will have a good weekend! Sounds like a wonderful cozy. My answer to the question of the week is: it depends. I don't like Orson Scott Card's political opinions but I've enjoyed most of his books. Come see what Grave Visions by Kalayna Price has to offer. Happy reading! I like that opener. It sounds like an amusing read. Enjoy! What a clever opening line. Sounds like fun. 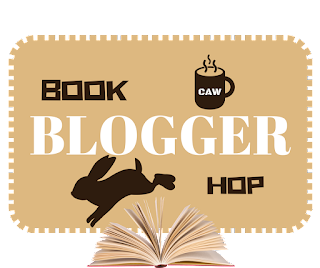 As for the Blogger Hop question, I agree with your answer, although I can't think of any books I've ever encountered that problem. Yes I totally agree with you as well, I do read dark reads. But I don't read books that are over the top dark or taboo books, because sometimes it clashes with my beliefs. Have a great weekend and happy blog hopping! I really like the opener of Double Whammy..it makes me wonder why I don't read more cozies. I don't like to be preached to or told how to think in books either. But I do not mind reading books with different viewpoints than my own from time to time. I think we benefit from staying open to new ideas and different ways of thinking. 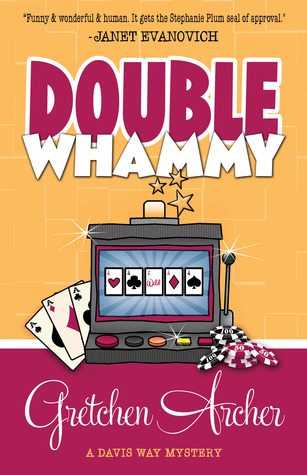 Double Whammy sounds like a lot of fun! I definitely do not like to be preached or harped at, and the minute it starts coming off with that vibe, I chunk a deuce and move on. I also share that for others who also do not enjoy that, either. However, I love when something is presented to me in a new or different way, or a topic is broached by an author and leaves it ambiguous and up to you to decide. You left me curious for more! Happy weekend! Happy Hopping. Enjoy your new read! It definitely depends on how the situation is handled. If it got in the way of my enjoyment of the book, then I have a big problem. This sounds like a good read. I can't wait to read your review! Well, I keep saying it -- I've GOT to get into cozies! Lol. This book looks very interesting. I like that it has some humor in it, as well. Hope you enjoy it! And yes, I'm adding it to my Goodreads shelves! I am complete agreement. Shedding light on an issue, versus pushing one's agenda, really does make a difference in whether I continue reading a book. My only question is: How do you tell the difference? There are some very skilled writers who covertly nudge our psyche with their passions and we don't realize it. This is what bothers me the most about a recent title I received. I agree with your pushy books point of view. Even if I agree, I don't care for them, and all I can think about is how they are probably turning off readers they might have been able to enlighten. I agree with you. As long as the material is not beating me over the head with the agenda, I'm fine. I don't like to be told how to think either. Thanks for sharing! I really hate when an author pushes an agenda in a book. Drives me crazy. Even if I sometimes agree with the underlying issue I just do not like being preached at in a book.